Today I’m happy to share one of my favorite sweet...!! Motichoor Ladoos are one of the most popular dessert served at just about any special festive occasion in India. The recipe is very easy to prepare at home and healthy for kids too. It is prepared from fine boondhi where the balls are tiny and is cooked with sugar syrup, ghee and mixed with sliced nuts. These ladoos comes out perfect and handy to gift pack for diwali. 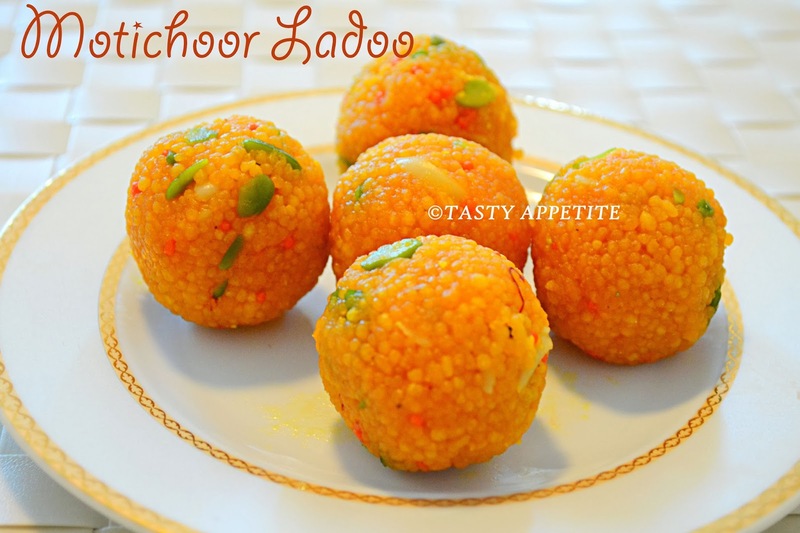 It tastes delicious and differ from other types of Ladoo. 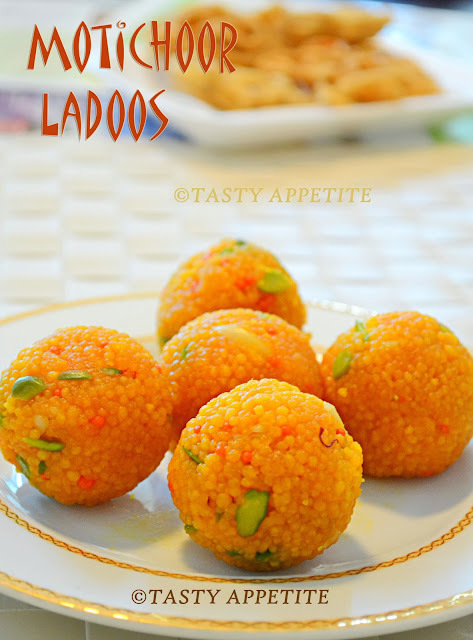 The appealing orange color of it do make the ladoos look more aesthetic and inviting. 1. Sieve gram flour along with powdered sooji and baking pwd. 2. Take them in a mixing bowl. 3. Add melted ghee and combine. 5. Now add food color and stir well. 6. Keep the boondhi batter aside. 1. Take sugar in a wide bowl. 3. Once the sugar is dissolved completely, bring it to boil with continous stirring. 4. Turn the flame to low and stir. 5. Keep boiling until the sugar syrup reaches one string / thread consistency. If you take the sugar syrup in your thumb finger and index finger, it should form one string consistency. 7. Add cardamom pwd, saffron strands, rose water and mix. 1. Heat up oil in a kadai / frypan. 2. Grease with oil and keep ready the perforated ladle or boondhi ladle for frying boondhis. 3. Now take the batter and pour it gently over the ladle. 4. 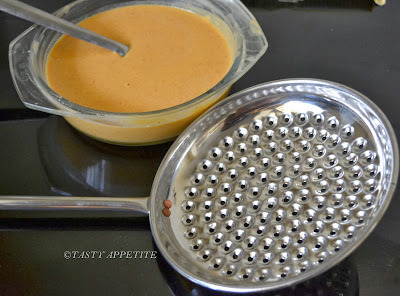 Rub the batter on the ladle with a spoon ( or tap the perforated ladle with spoon ) , so that small drops of batter drop in oil. 5. Fry boondhis on medium high flame for few minutes. 7. Remove in a tissue and keep aside. 8. Repeat the same till all the bhoodhis are fried up. 3. Pour the warm sugar syrup over it. 4. Give a quick stir. 5. Take this in a blender or food processor. 8. Grease your hands with ghee / oil and take small portion out of it and make ladoos. 9. 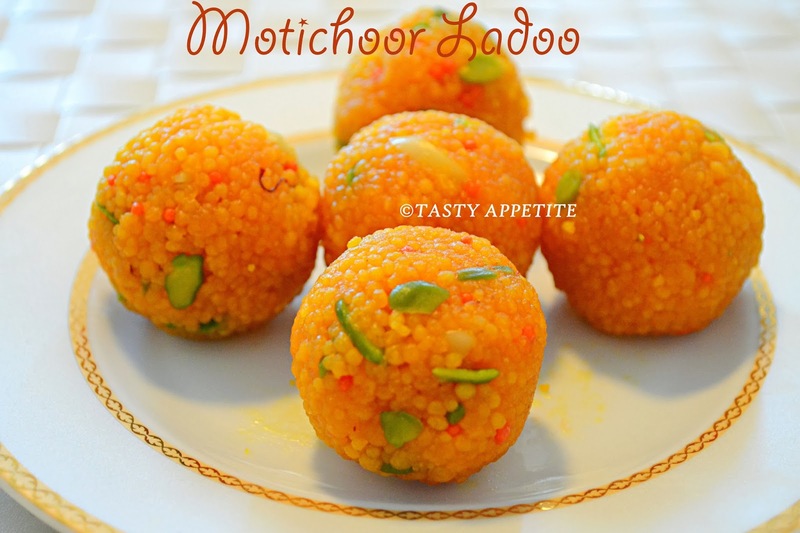 Tempting Motichoor Ladoos ready to enjoy. 10. Garnish each ladoo with broken almond, or a pistachio as you wish. 11. It remains fresh for 3 to 4 days in room temperature and you can refrigerate it for more days. · Sieve the besan flour well to remove lumps. · The batter prepared should be in dosa batter consistency, neither too thick nor thin. · Adding baking soda to the batter helps in perfect puffing of bhoondhis while frying. · Clean the perforated ladle from batter for every batch and keep the ladle a little high from the oil, this will also helps to get perfect round shaped bhoondhis. · Make sure the oil is hot while dropping the batter and also take care not to overcrowd the oil, there should be only one layer of bhoondhis in oil. · Remove the bhoondhis immediately, while it stops sizzling in the oil. Thanks Jeyashri, its just pulsing for few seconds, so that the ingredients bind together, and the boondhis doesn't get mashed up. woww.. perfectly made laddoos.. yummy!! It could have been helpful if you could have showed the boondi laddle as the laddle for motichoor ladoo is very difficult to find here....Can you add a pic of it? Thanks for stopping by friends and your sweet notes. Sharmilee : This is the perforated ladle I used for preparing bhoondhis. Its available in all our Indian stores. Wow..Love ur ladoos.Like sharmilee was asking you about the ladle.Is there different types of ladle available in market (I meant the holes)or all same ones. so perfect ladoo's just like the store bought ones! where in chennai, you bought this boondhi karandi jay? The laddoos loke so colorful and awesome. I want them ! can I grab it from the screen!!! awesome it looks... one question - is the boondi ladle for this one different (smaller) than the regular boondi ladle? Wow.. They look just perfect.. No doubt! Splendid.. I bet much better than storebought! WoW..Perfect..pls send a platter full of these amazing..mouthwatering ladoos...HATS OFF to u Jay!!! Was expecting stepwise pictures! :) my favorite sweet! It's been a while I prepared them.. 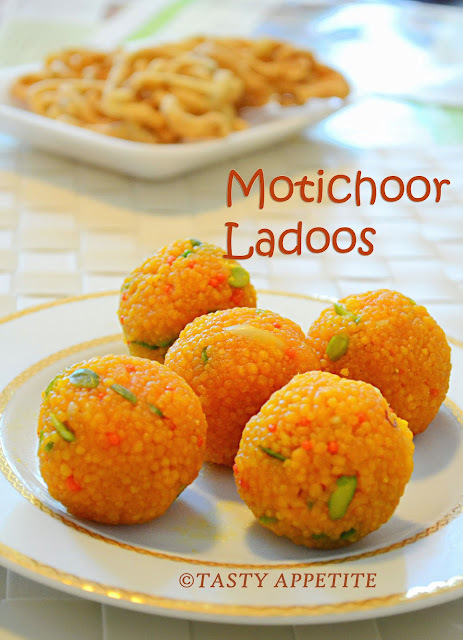 Simply awesome looking motichoor ke ladoos. Wonderful pics. 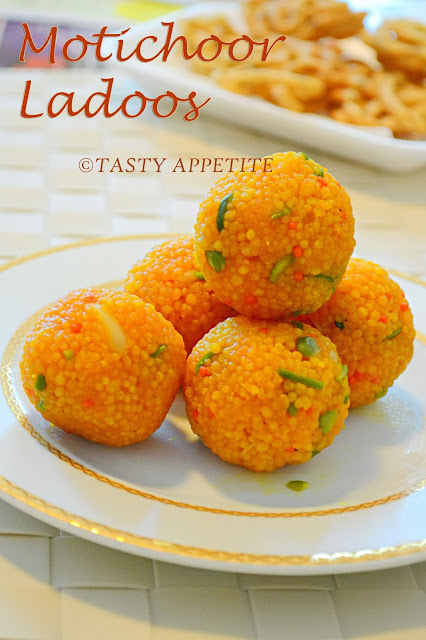 The ladoos look so good. My hubby has gone to India and I added boondi karandi to the list. I'm definitely making this once I get it. Good work Jay !! hi jay garu.. awesome n colorful ladoos.. Nic pics. Loved it. 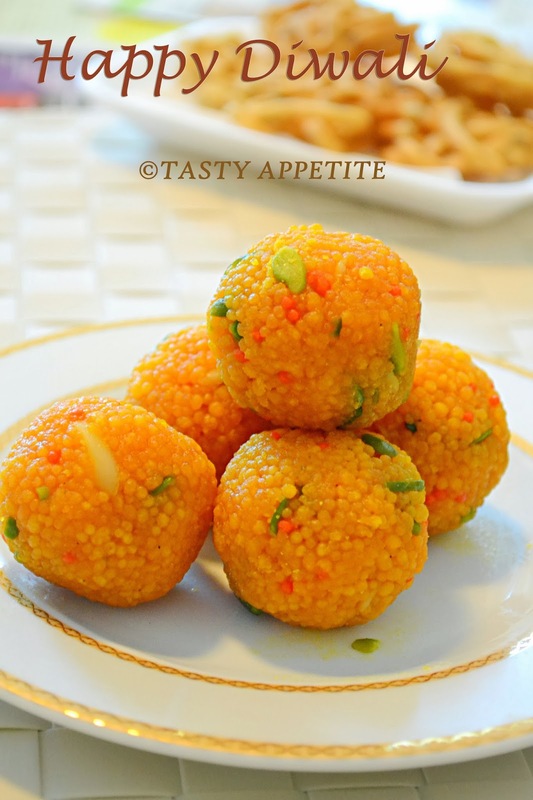 Thanks for uploading the pic Jay!But this is the same laddle I have and used it for boondi ladoo....the boondi comes out big with this laddle...am wondering how did you get tiny boondis for motichoor with this laddle....can you please clarify? I have one doubt what is powdered suji? and please let know the water quantity for batter of one cup? Very nice...i like ur recepi...ur ladoo looked prety enough..